Here's the postcard for the latest show at Allegory Gallery! The new show is called, "Human Nature" and features work by Lorie Lee Womack. The show runs from January 6th to February 2nd. 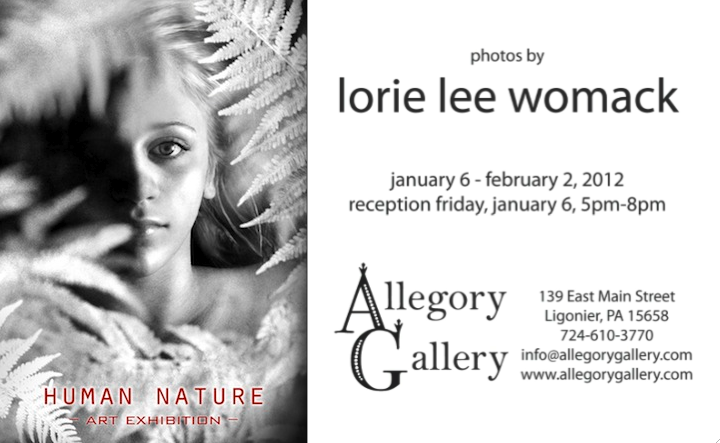 The opening reception is Friday, January 6th from 5PM to 8PM. If you're around, you should definitely stop in to see these hauntingly beautiful photographs! Last year in Tucson, I took a workshop with the very talented Barbara Lewis. I had a wonderful time, but was reluctant to put together my enameling workstation. I had all the equipment, but there was just this mental block that prevented me from getting things setup. When Barbara came out with her book, Torch-Fired Enamel Jewelry: A Workshop in Painting with Fire, I simply couldn't put it down. 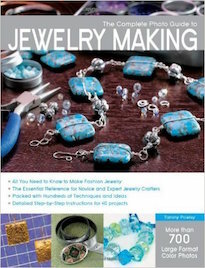 It's just full of beautiful projects and tons of inspiration! I used it as a prompt (along with my "resolution" to complete projects) to finally get things put together and start enameling. Above are the results. I'm slowly playing around and testing out the various color combinations and the reactions to the flame. It's my hope to build a recipe book and a color-wheel, so that I can recreate particular colorways. It's very exciting and my brain is buzzing with all the potential things I can make! Somehow in the rush that is the holiday season, I neglected to stop in to wish everyone a happy Yuletide season! I do hope that everyone had a most spectacular holiday season and will have the brightest and best New Year ahead. It's an odd time of year. Usually it's so packed full of activities that it's hard to find time to do anything but what is most urgent and unfolding right in front of you. But in the quiet hours, I'm left thinking about the people in my life who have passed away or are still missing. I've been having the most vivid dreams about my brother. Even though it has been over twenty years since he went missing, I still think of him. I dreamed that he was sending a package from Germany and that it had a video of us when we were kids. The images were scratchy – captured with a Super 8. We were happy. Playing in the yard. All of us. While I do still think of him, what I remember most is the void that was created when he left. The memories of him before he was gone are harder to pin down now. It has been such a long time. So I am grateful for those dreams that come in the night, that hold a clarity that my conscious mind cannot. Whether or not it is connected, I've also been thinking a lot about all the open projects that are still in the works. I think it's time that many of them be completed. It's not just a New Years resolution to declutter my life, both of the physical and mental piles building up, but a way to find closure. So in the coming weeks, I will be addressing finally finishing many of the things that were set in motion, but have yet to be ticked off the list. It won't be easy, in my zealousness to remain creative and fluid, I've started many things that have been pushed to the side. I've let life get the in the way. So if you've been waiting for something from me... know that I have not forgotten you and that things will be righted in short order. 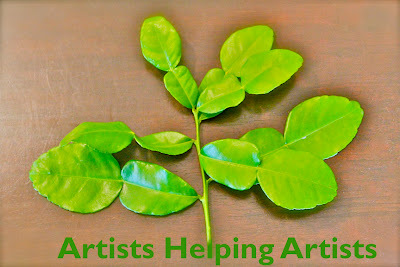 You might have noticed that there are three different (recent) posts titled "Artists Helping Artists" on this blog, featuring three different artists for three different auctions. Confused yet? Instead of having one post with all three of the silent auctions going on at once, I've separated things out into three different posts. Each silent auction comes with its own distinct prize. 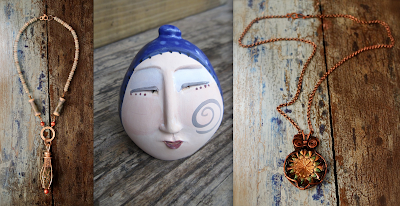 In these posts, you'll find a very special necklace by me (Andrew Thornton), a beautiful ceramic Spirit Rattle by Nan Emmett and a very chic necklace by Maria Richmond. You can bid on one or ALL of the auctions, if you like. CLICK HERE to vist my auction. CLICK HERE to visit Maria's auction. CLICK HERE to visit Nan's auction. This silent auction features a piece by the talented Maria Richmond! She's put up for auction a stunning necklace! 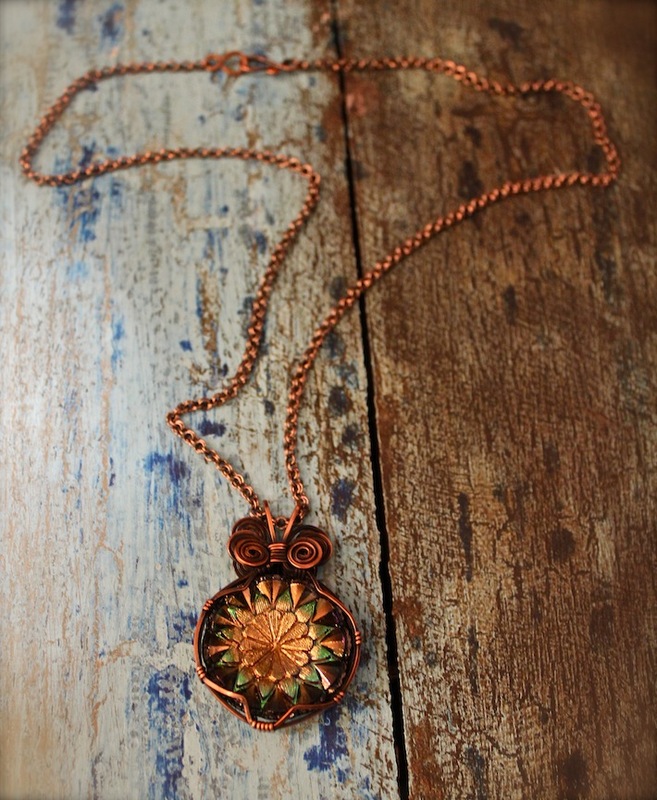 The focal is a vintage button surrounded by her gorgeous wirework. It is paired with a handcrafted clasp and vintage chain. It really is a work of art! The starting bid for this piece is $14. 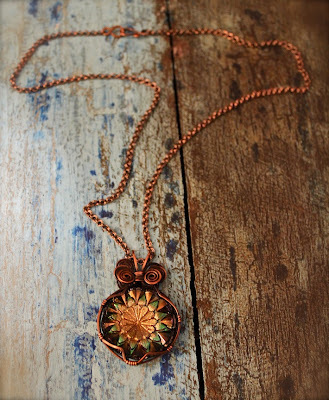 Would you like to call this lovely wearable art your own? Please leave a comment on this post for this necklace by Maria Richmond with your bid. If you are the winning bidder, you will receive an invoice after the close of the auction. The auction closes at midnight EST, Wednesday, December 28th! There must be a way for you to be contacted. If you have your email preferences turned off, please leave your email address. 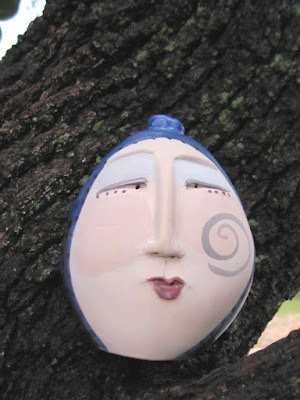 You can also bid on a fabulous ceramic Spirit Rattle on this blog by CLICKING HERE or a necklace made by me by CLICKING HERE. For simplicity's sake, I've divided each of the auctions up on this blog into three separate posts. 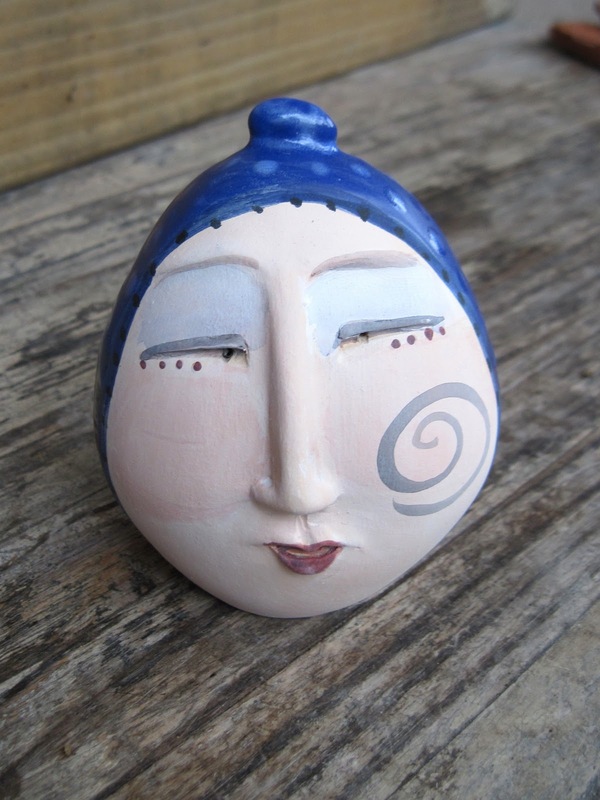 This silent auction features a piece by Nan Emmett of Spirited Earth. She's contributed one of her handcrafted, ceramic Spirit Rattles. The piece, measuring 4"X3"X2", is hand-painted and makes a musical tapping when you shake it. Would you like to call this beautiful piece your own? Please leave a comment on this post for this Spirit Rattle made by Nan Emmett with your bid. If you are the winning bidder, you will receive an invoice after the close of the auction. 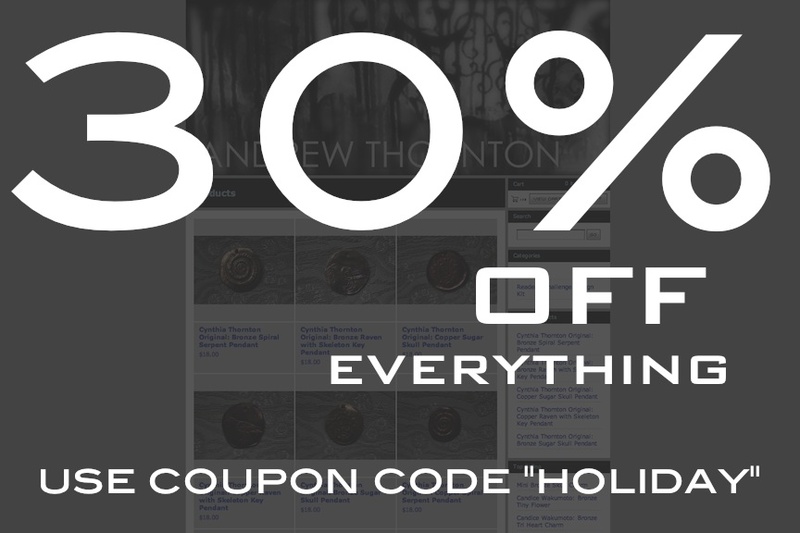 The auction closes at midnight EST, Wednesday, December 28th! There must be a way to contact you; please leave your email address if your email preferences have been turned off in your profile. 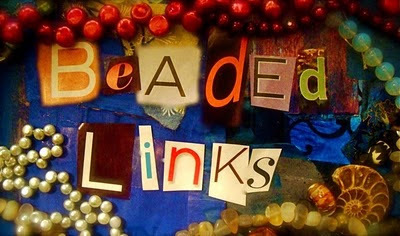 Don't forget, you can also bid on a necklace by me by CLICKING HERE and a necklace by Maria Richmond by CLICK HERE. 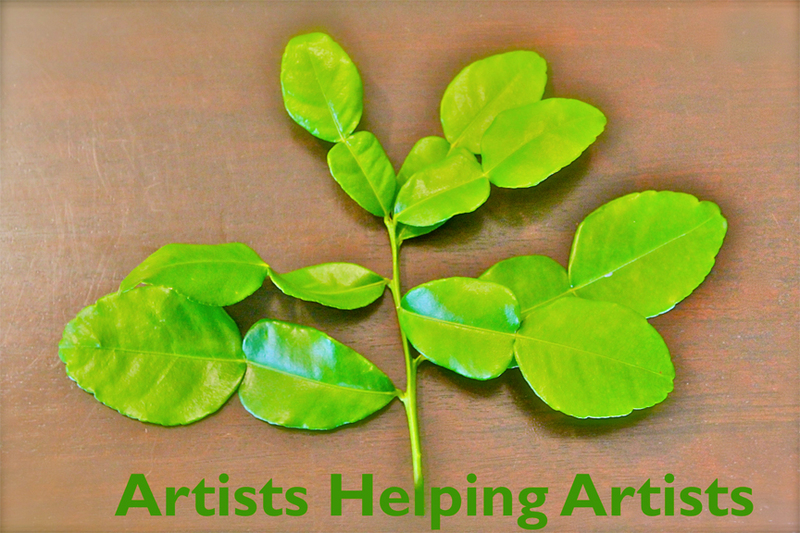 Once again, several artists from the blog community have decided to band together to help a fellow artist in need. 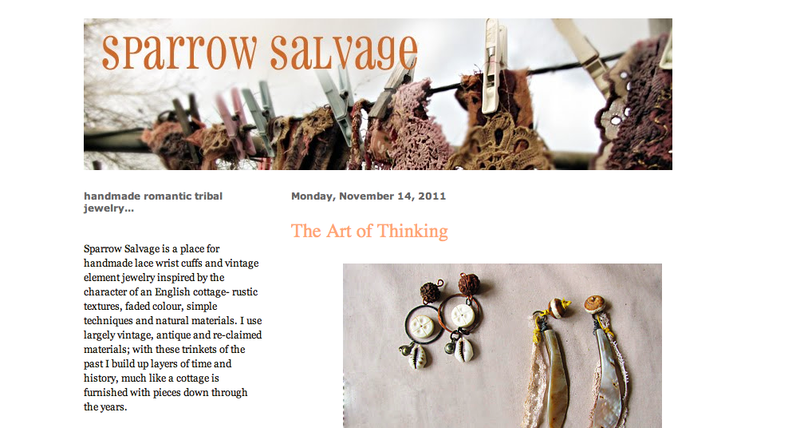 This time, the proceeds go to Penny of SparrowSalvage. She was recently in a terrible car accident; she was injured and her mother passed away. My heart and prayers go out to her in this dark time. For me, the holiday season has always been about giving. 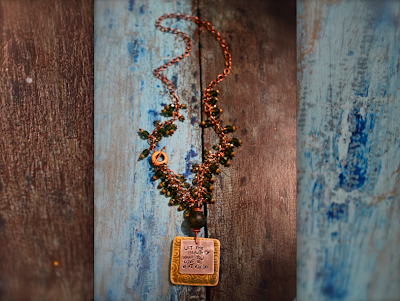 And in this spirit I created a necklace to auction off here on my blog. BUT... as I stared at the piece, I wasn't really satisfied. It was pretty and all that... but it didn't really mean anything to me. So, I decided to go BIGGER. Not so much in size, but in emotional value. The piece that I'm auctioning off contains a focal lampwork glass bead made by the late, Shannon Hill. He was a talented artist who added beauty to the world and was always friendly. He faced his illness bravely and embraced life right up until the end. I've held on to this bead for years, wanting to use it in some special way. It has seen many incarnations, but finally found its way into this piece. I've set the bead in a unique fine silver prong and basket-weave setting. The pod-shaped form dangles from handmade, fine silver rings. The focal is paired with ceramic beads from Keith O'Connor, Swarovski crystals, faceted amazonite, Thai silver, and faceted pearls. I definitely don't have a lot of extra cash laying around, especially this time of year and with the store, but I wanted to contribute to Penny's recovery and to help ease a painful time. I wanted to donate something that really meant something to me. The starting bid for this piece is $20. Would you like to add this piece to your collection? Please leave a comment on this post for this necklace with your bid. If you are the winning bidder, you will receive an invoice after the close of the auction. 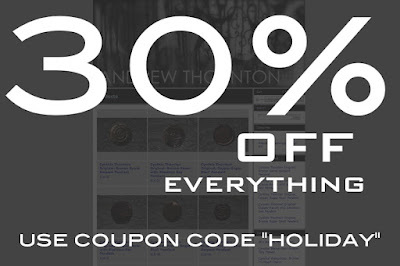 The auction closes at midnight EST Wednesday, December 28th. There must be a way to contact you. If you have email preferences turned off in your profile, please leave your email address as well. But wait... that's not all! Many other artist are auctioning off items to help out as well! 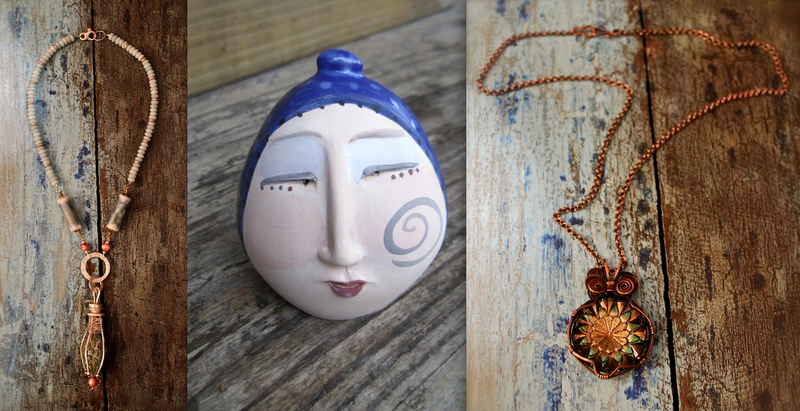 Maria Richmond and Nan Emmett have both generously offered up pieces for auction. CLICK HERE to visit Maria's auction and CLICK HERE to visit Nan's auction on this blog. Thank you for bidding and happy holidays! 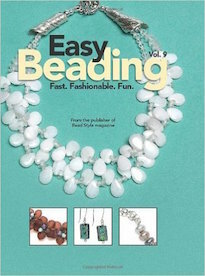 Another magazine that recently came out that features my work is the latest issue of BeadStyle. 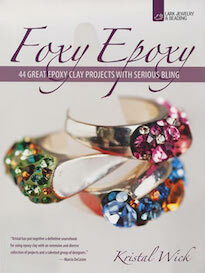 It's the winter issue and is loaded with lots of lovely seasonal jewelry and lustrous pearl projects! The project that I made is a multi-strand pearl affair featuring a lovely piece by Gail Crosman Moore! Definitely check it out! I had mentioned on Facebook that I was working on a surprise for the store. One of our regulars heard that I was in search of another big table and brought one in. I loved it! But I wanted to incorporate it better and thought that a coat of paint would help tie it in nicely. So... seven coats of acrylic enamel called, "Catwalk" later... I present the latest addition to the store. 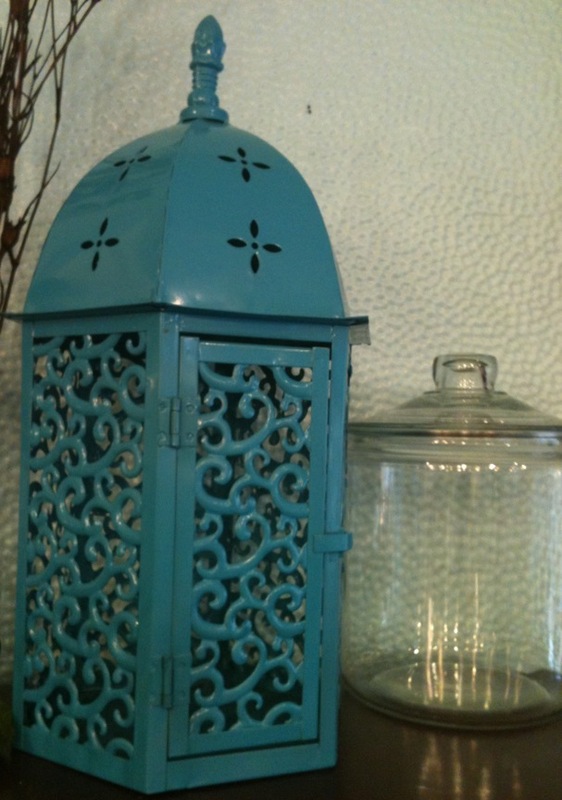 The color inspiration for the new table came from one of the lanterns that I use to decorate the store. Since everything else in the store is relatively subdue with dark wood, pale blues, whites, and metallic pewter colors... I wanted to add little pops of color. The bright, saturated color of the lanterns and now the new table, help to add a little visual excitement and act as focal points around the space. It just occurred to me that I never wrote about two of the magazines that I was recently in. 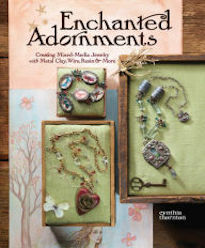 Both of them are special issues from Interweave. The first one to come out was Creative Jewelry. I've got a few projects in it AND a feature called, "Say it with Stones". 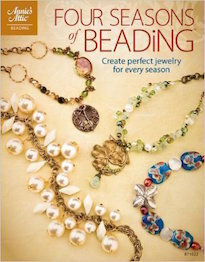 The next that came out was an issue of Handcrafted Jewelry. I've got two projects in there! I made variations of those projects and will post them shortly. I encourage you to check these magazines out if you haven't already! They're killer! 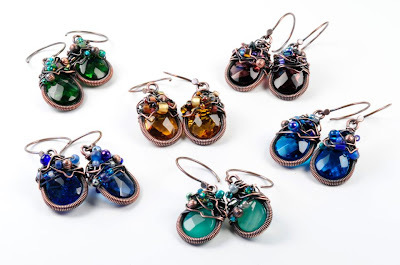 The next class that we're hosting at Allegory Gallery is Maria Richmond's "Brio Scribble Earrings"! I'm really looking forward to this one; it looks like a lot of fun! 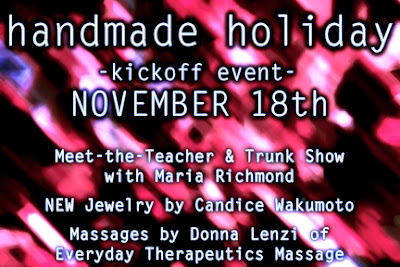 The class is this Sunday, December 18th from 4PM to 8PM. For more information and to sign up, CLICK HERE. A blog reader wrote in after I posted about the Mystery Destash and asked what specifically were the future projects that I'd like to tackle. The truth is... I don't know. I can think of a dozen or so different things that I'd like to do. I'd love to do more felting and silk painting. I had such a blast making that Merino wool scarf the last time I was in Asheville! Speaking of fibers, I'd love to work on my sewing skills. It'd be interesting to explore creating jewelry components and adornment out of these materials. Another project would be to work on my own line of cast components. I'd love to get some pieces cast in bronze and shibuichi. I'm just smitten with these metals. I do love making the pieces that I currently sell out of metal clay by hand, but it would be nice to have some of the more popular ones cast. It'd open up the selling possibilities and allow me to spend less time on production and more time on creating original designs. 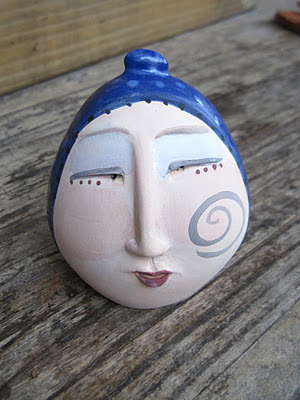 I would also love to add color to my new porcelain pieces with glazes. Most of my training is in painting and I am curious to fuse these different aspects of my "creative personality". I'd be lying if I said I wasn't tempted by the new Sterling PMC and Sherri Haab's electroforming kit. I have so many different ideas of how I could use these new products. The words "hog wild" come to mind when I think of all the things I could make! 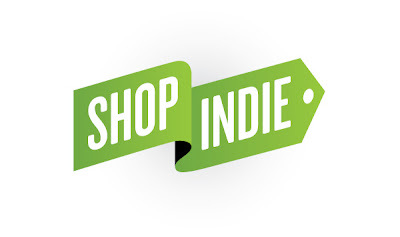 A few extra bucks would definitely go a long way in my creative endeavors. With the new year about to begin shortly, I want to make creative exploration my biggest goal. My future projects, whatever they may be, are all about returning to the joy of making. The first award I ever won for something I created was for a little stoneware pot. I made it in art class while I was in kindergarten. The crude little earthen vessel was formed using my elbow and adorned with "magical symbols". Mrs. Dillard, my first art teacher, liked my descriptions of the powers of bowl so much that she had me demo making the pots at the year-end student talent showcase. My class had been chosen to perform "Ten Little Indians" earlier in the evening and I was dressed up in a stamped pillowcase, a macaroni necklace and a construction paper headdress. I think the outfit did much to complete the scene as I regaled the audience with stories of "witches bones and warrior faces". It's no surprise that in my quest to return to joy of making things that I should go back to making little pots. They're more refined than the ones that I made in kindergarten, but not by much. I kept them simple on purpose. These ones are made of porcelain and meticulously pinched out. They fit in my hands perfectly and retain the finger-prints – evidence of their handmade origins. For more texture, I used shells and porcupine quills. I tried to make them as thin as possible. After they were fired they took on a musical, bell-like quality. I must confess that I delight in flicking them to make them ring. I've made dozens of them now. Some of them fit together. Others stand alone. I've glazed them with clear glaze and am dreaming of adding color in the future. I don't know what to do with them besides look at them and examine them. Some have suggested that I might sell them in the store, but for now I'm just happy with the process of making them and returning to a child-like glee, telling myself stories of magical bowls. 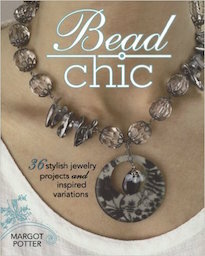 This is a fun way to add to your bead collection while helping me reduce the size of my bead hoard! Purchasing a "kit" also allows me to buy supplies for future projects and keeps me creatively busy. 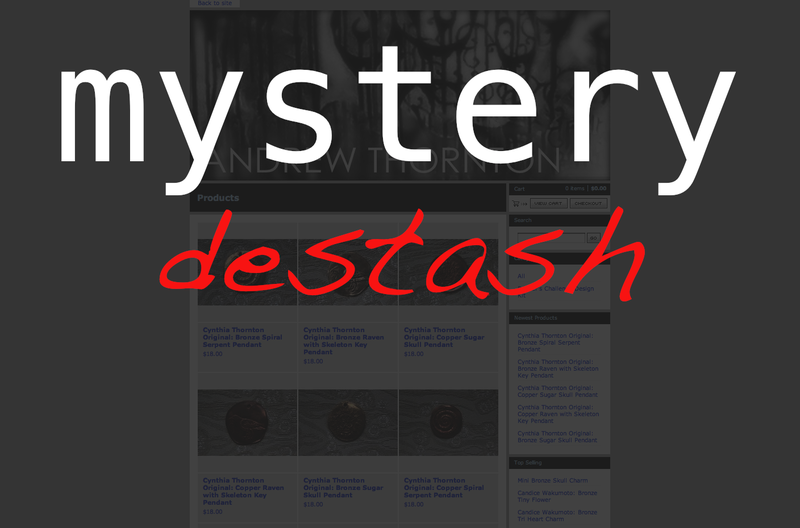 There are only 20 Mystery Destash "kits" available. Each one is a complete mystery and is unique and different from the rest. No two kits are exactly alike. Only I know what's in them until they arrive at the buyer's doorstep. Only one (1) kit per person. All sales final and no returns. All orders will be shipped out first class mail. Have questions about shipping? CLICK HERE to visit our shipping policies. 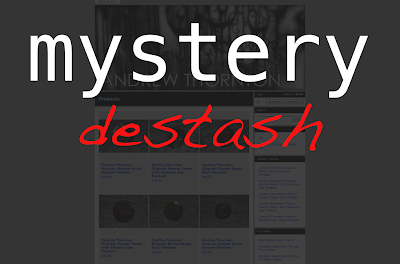 Mystery Destash "kits" are available while supplies last. CLICK HERE to visit my shop to get your Mystery Destash kit before they're gone! With a bid of $100, Karin of Backstory Beads landed this necklace I made to help raise funds for a fellow artist in need. 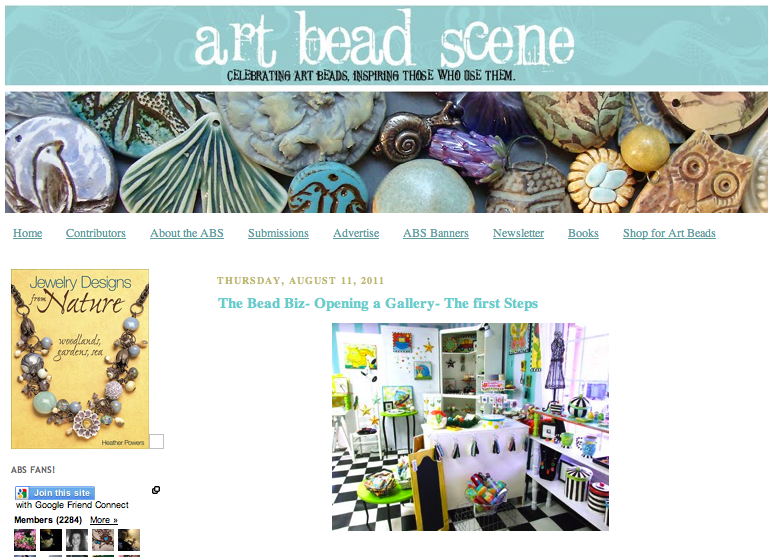 Please stop by Karin's blog and congratulate her on supporting the community and this great cause! I've been busily making things in the background. I try to squeeze in a few projects everyday. The other day I made some bronze pieces for my own jewelry. I've also been wire-wrapping like crazy. There's something calming about the repetitive motions and I'm a smitten-kitten with the end results. 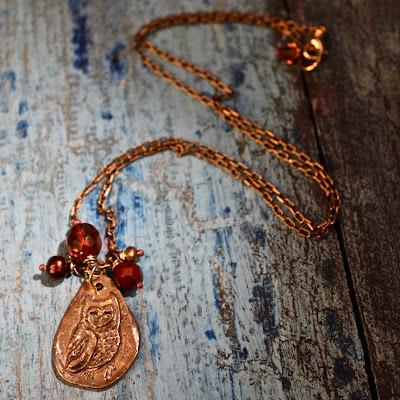 Above is a new owl pendant that I created. It's really simple and almost a "primitive caricature". It has a nice weight and shape to it... kind of like a worry stone. 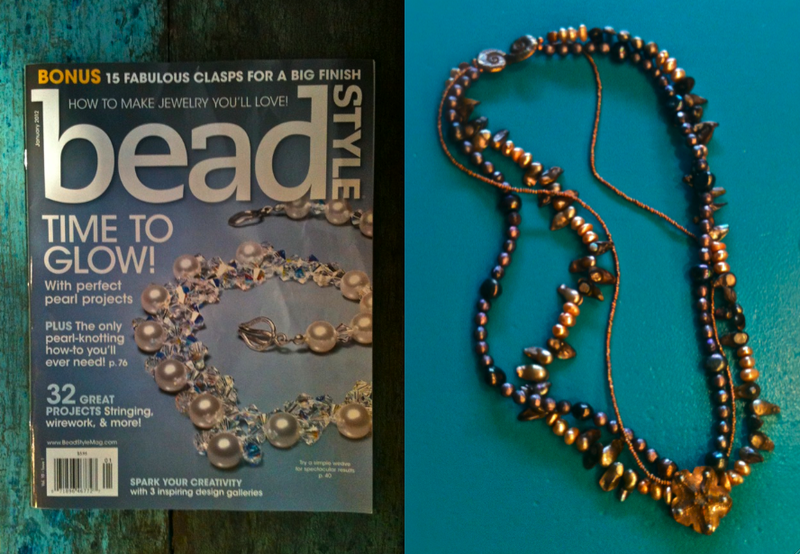 I put it on a long chain in this necklace and paired it with some Czech glass, Swarovski crystals and pearls. These earrings are really simple as well, but I love the way the little bronze pendants twinkle in the light as they are being worn. It almost looks like the birds are ruffling their feathers in their floral perches. The pendants are matched with some Czech glass and some copper earwires. This necklace didn't start out like this. Originally, I had this huge cascade of rough amber with these dangle-embellished bits of chain hanging off of it. But I wasn't quite sure about it. It looked too busy and too disparate. So, I took the necklace apart and this piece resulted. I used the chunky amber components in another piece. 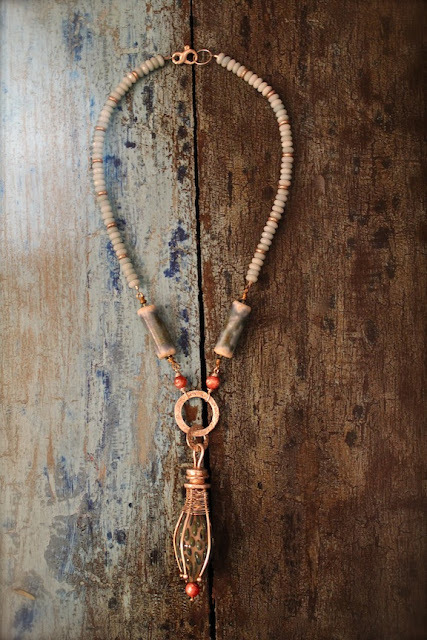 In this one, I decided to highlight the fringe-like embellished chain and use a ceramic focal bead by Keith O'Connor. It matches the orangey coral bits perfectly. I added little bits of blue to this bracelet. In the picture, it's hard to see them, but they're there. And I think the provide a nice contrast to the metallic cranberry color. The link is of a bird with a heart on its chest. I'm considering filling the heart in with a bit of colored resin or enamel. We'll see. I sort of like it without the extra dot of color. I was inspired by an ancient Roman pattern when I made the bronze pendants for these earrings. It's like a stylized wheel or flower or sunburst. I quite like it! I used purple crystals in these earrings to add a little pop and contrast to the bronze components. The last piece that I'm going to share in this post has a tree pendant that I made out of bronze. 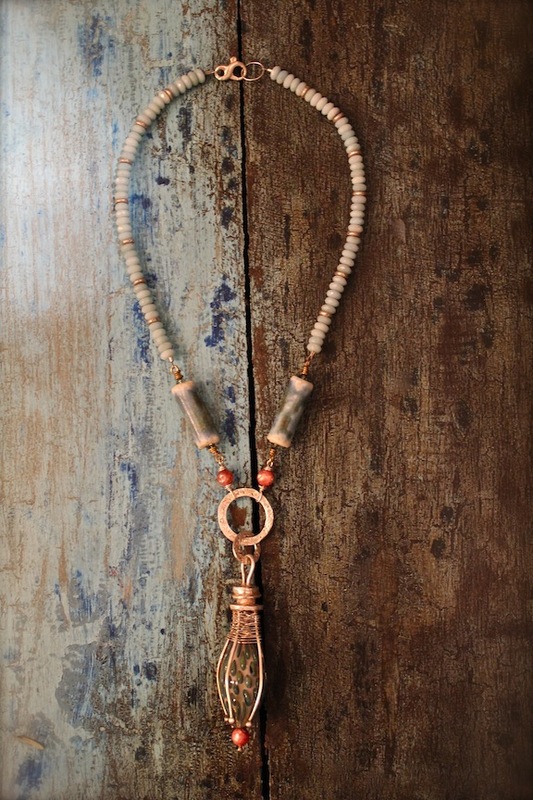 It's layered on copper filigree and paired with what I was told was fossilized dinosaur bone cylindrical tube beads. I created a long wire-wrapped chain out of the beads. 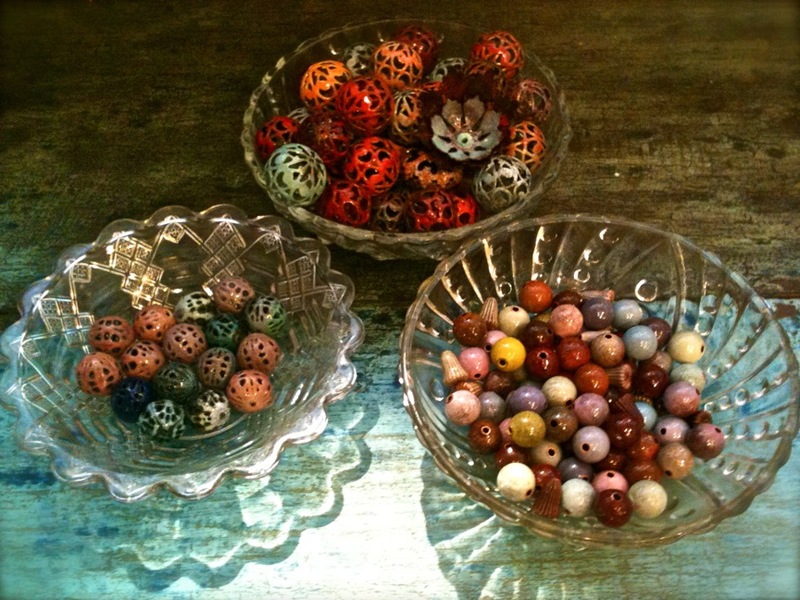 I'm quite pleased with the result and have been digging out all my cylinder beads to make more necklaces like this. I went to what some would consider one of the best Art schools in the country. (There are some that would even say that it's one of the best in the world!) What we learned was heavily influenced by the contemporary Art world and what was being made in today's Art market. But to understand what was going on NOW, we had to look at Art history and Art criticism. Knowing the rhetoric and theory was a way to form the appropriate context to navigate the wilderness of Art with a capital "A". The Art world we had learned to make in was an old one, reaching back to the dawn of civilization. It's tired and jaded and has seen almost every trick under the sun ad nauseam. It eats up and spits out artists on a daily basis. You'd think a creature such as this would be lone monarchy, ruled exclusively by its cynical experience. But it has a consort. The Art world we learned about went hand-in-hand with that of the Money market. Money with a capital "M". The state of the economy was tied to ebb and flow of the Art market like the moon is to the tide. A booming economy could herald a Renaissance in Art-making and an explosion of new artists. In that world, you could hang a blank canvas on a wall (which has already been done, by the way) and as long as you could frame it with the right Art historical context and had the right dealer, it would be valid and transcendental and a true Artistic expression. I learned a lot in Art school. But the thing I learned the most about was doubt. I'd ask myself questions like, "Is this Art? Where does this fit in the Art world? Who would want this? Will it sell? Will Art collectors want to collect this? Will I be remembered?" What I learned... what I was trained to do... was to ask questions. I think a true artist is someone who listens to their own voice and creates answers. This is not to say that they're an egomaniacal Howard Roark, but someone who listens and considers all angles, but ultimately follows their own gut. They ask questions and investigate, but come away with findings based on their experiences and their entire world... not just a single facet. The hardest lesson that I had to learn came after school. The lesson came when I was out of the warm cocoon of theories, classes and syllabi... it came when the economy wasn't booming anymore. I had to learn to unlearn. It's something that I'm still working on. I am learning to quiet all the voices and the questions... and to simply make again. I might have titled this post, "Discovering Joy Again", because that is the aim of this self-deconstruction. It's all about learning to trust in my own voice again. 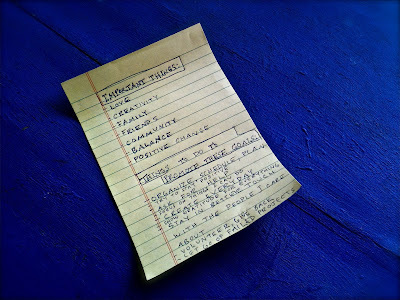 As pretentious and pompous as this post may seem, it's part of an explanation of my road back to something fundamental and inherent to who I am... a maker of things. Maybe one day I'll be an Artist with a capital "A", but I'm not worried about that just now. Instead, I'll go make something. One of the best things about our creativity community is that we support one another. If we need to raise a barn, there are ample hands on deck to help. I know firsthand how generous and caring our group of like-minded individuals can be. When I had cancer and the time when I wanted to start Allegory Gallery, the community was behind me all the way. So I wanted to take this opportunity to give back. The artist, who shall remain anonymous, didn't ask for help, but she is definitely deserving. I can't go into the details of her situation, but she is indeed a valued member who inspires others and creates beauty wherever she goes. While I wanted to give back to this beautiful soul, I don't exactly have a lot of extra funds laying around to contribute. But what I do have are two hands, an imagination, and lots and lots of stunning beads to work with. I created this necklace to auction off. 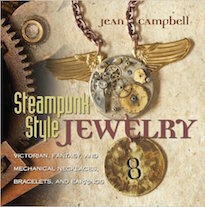 The pendant is a hand-stamped sterling silver piece by Heather Wynn-Millican of SwoonDimples. It has a very apt Rumi quote on it that says, "Let the beauty of what you love be what you do." 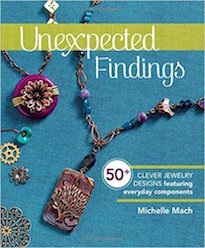 It's layered with a ceramic pendant from Marsha Neal Studio. The focal pendants are paired with a lampwork glass "Vermont Trade Bead" by Harold Williams Cooney, an enameled toggle from C-Koop Beads, lots of Czech glass dangles, and a copper-plated chain. Please leave a comment along with with your bid. If you are the winning bidder, you will receive an invoice after the close of the auction. The auction closes at midnight EST Sunday evening. There must be a way to contact you. If you have email preferences turned off in your profile, please leave your email address as well.